We’re in the process of planning some animations and adverts. I love the fact that the children are coming up with ideas I haven’t even considered. My only regret at the moment is our lack of a green screen. My favourite ideas so far include making a scratch animation or pivot stick animation and using it with a green screen. 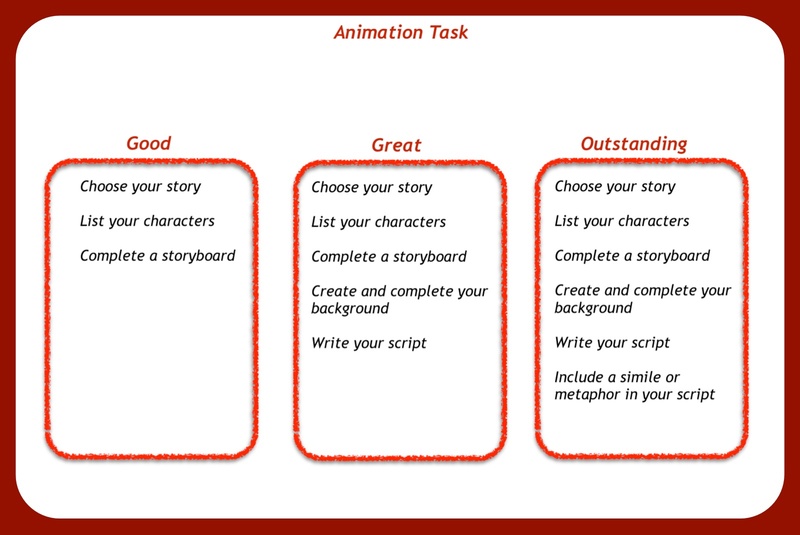 When we were planning the animations I used a ‘good, great, outstanding’ sheet. I hadn’t realised that this was a format I hadn’t used for a long time and the children really liked it. The good thing was that most of them were determined to achieve a minimum of great, but were aiming for outstanding. At the end of the lesson I even had several requests to use the same format in more of my lessons. Hopefully we’ll be animating at the end of the week and I’m aiming for outstanding. This entry was posted in animation, Film, iPads and tagged animation, planning. Bookmark the permalink.